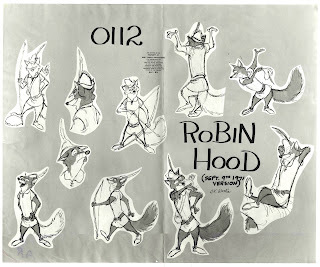 Character and Creature Design Notes: A study in anthropomorphism: Disney's "Robin Hood"
A study in anthropomorphism: Disney's "Robin Hood"
Anthropomorphism is defined as the attribution of human characteristics to animals or non-living things, phenomena, material states and objects or abstract concepts. Examples include animals and plants and forces of nature such as winds, rain or the sun depicted as creatures with human motivations, and/or the abilities to reason and converse. The term derives from the combination of the Greek ἄνθρωπος (ánthrōpos), "human" and μορφή (morphē), "shape" or "form". 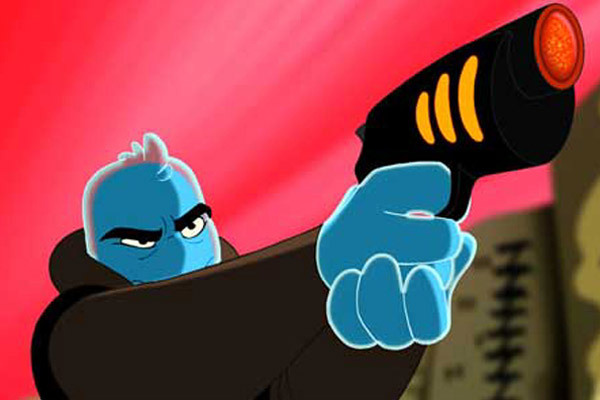 With such a broad definition one realizes that anthropomorphism covers characters as diverse as Osmosis Jones, Mickey Mouse, Hamm, Bagheera, Draco the dragon, and the Pixar luxo lamps. 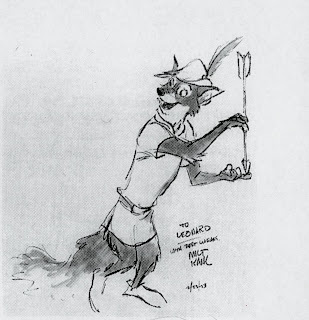 All are anthropomorphic characters, but in animation when one mentions an "anthropomorphic character", they usually mean a very specific type of animal character design. 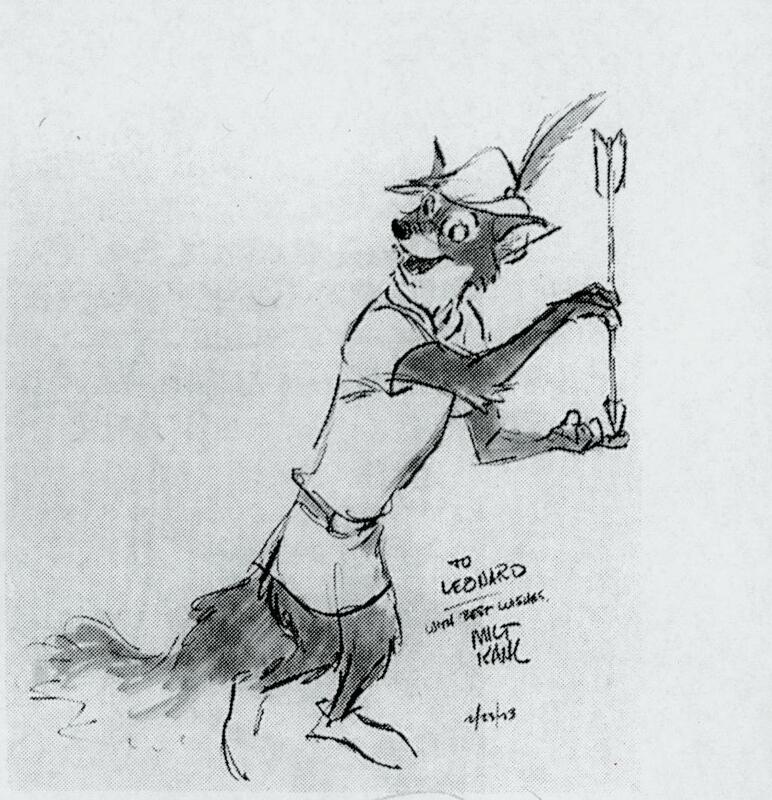 And more often than not the first one that pops into most animator's minds is Disney's Robin Hood. 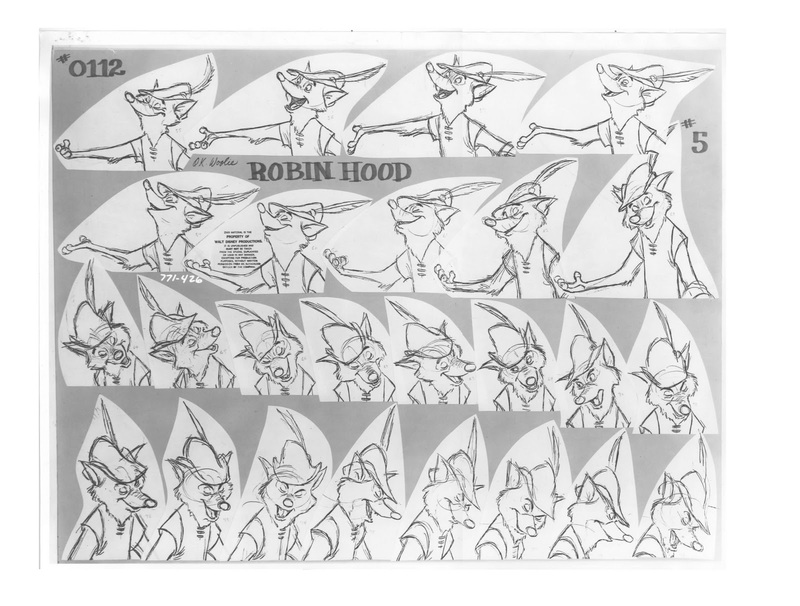 While I can't state definitively why Robin Hood in particular is seen by so many as the quintessential anthropomorphic character, I can say that he is a classic case of form following function in animated character design. The studio chose to tell the "Robin Hood" story with animals. 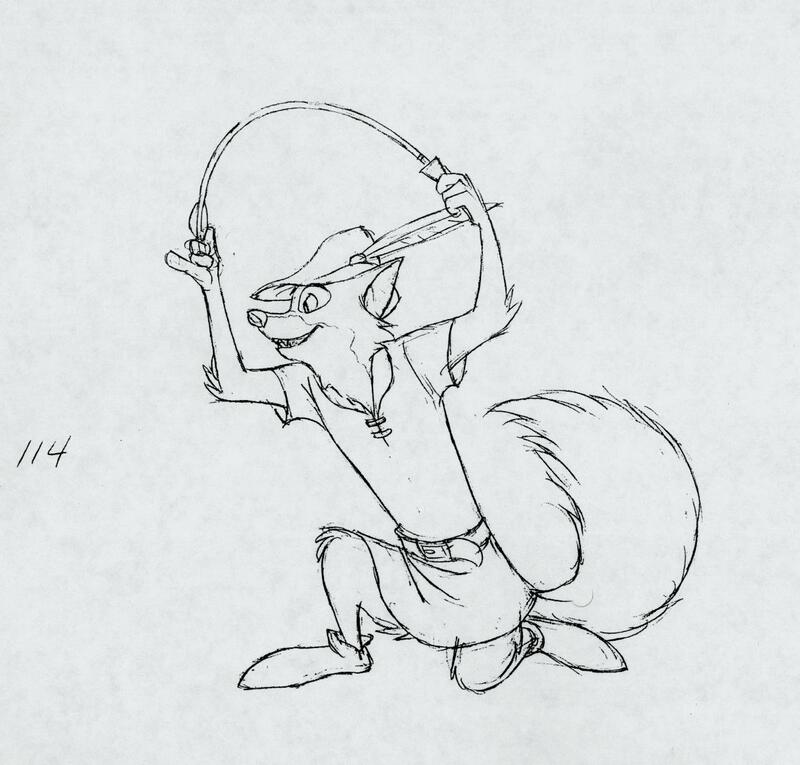 A fox, known for being a clever, attractive, and thieving animal, was the natural choice for the title roll. 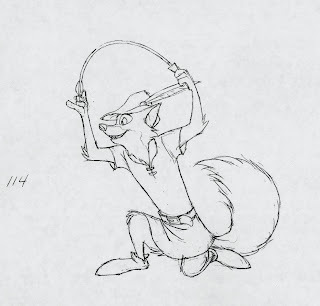 But there's one obvious problem with animating a more natural fox (such as Bagheera, who was a very natural panther); he has to draw a bow. His humerus is too short to allow him to draw the bowstring all the way back to the level of his ear, he has no opposable thumbs to allow him to grasp the bow in the first place, and his toes are likely too short to hold an arrow to the string. Plus, standing on what amounts to his tiptoes to do all of this becomes rather awkward. As always; allow your character's design to follow the functions they must perform in the story. Doing so makes an animator's job much, much easier! What a great post, very insightful. I love this blog. The placement of what is suppose to considered the whole foot is an interesting way to solve that problem, especially more complex animals. Also the placement of shoulders to have the animal still keep it's look but still do human things was interesting as well. 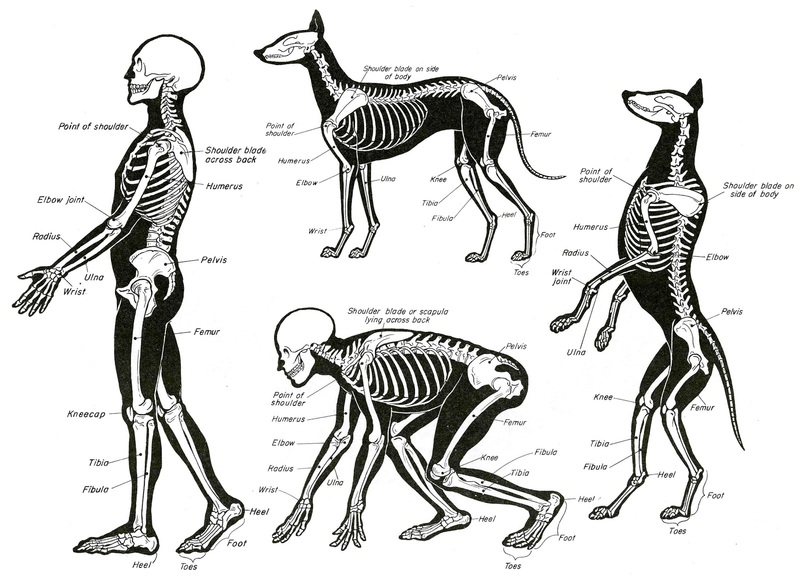 There is a clear difference between original animal and anthropomorphism. Very informative! 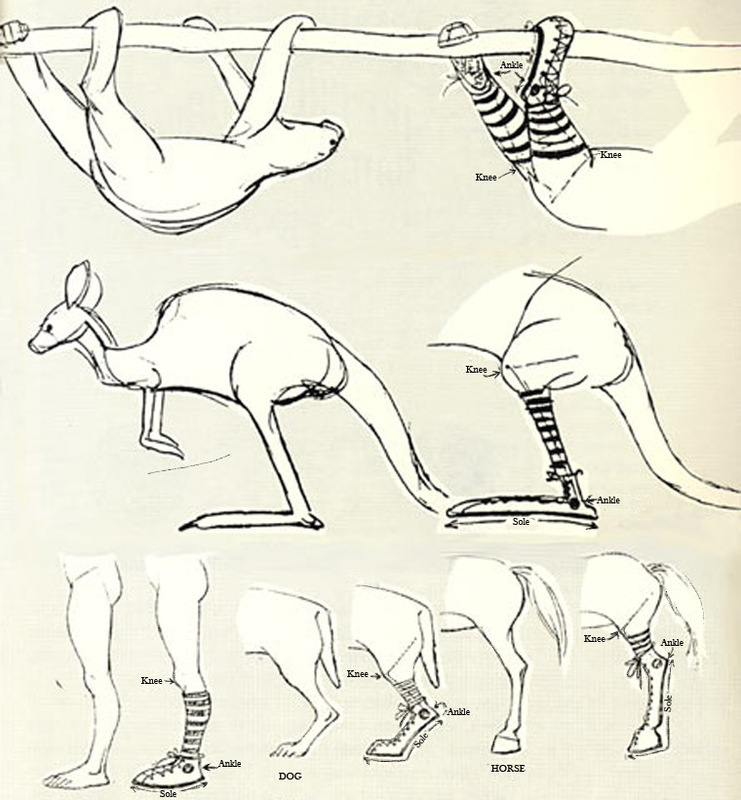 I particularly enjoyed the info about Chuck Jones' method of adapting the hind limbs. Makes a lot of sense! Wow I learnt a lot from reading this. Thank you! Thank you for post and sharing this ! Thanks for the feedback guys. Much appreciated! This is quite interesting, curiously, when I needed to explain to my mom what anthros were I referred to Robin Hood! 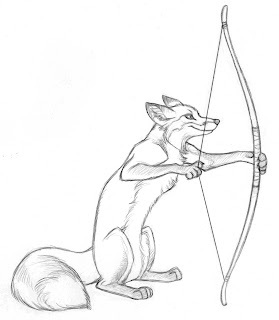 without knowledge of animal anatomy the problem with a natural fox using a bow wouldn't have been solved like it was. It gives me another way to look at designing my animal caricature. This is a great post. I don't think I would have realized this without you pointing this out...in fact, I know I wouldn't. Very enlightening. Thanks so much. I'm not sure I'll do an anthropomorphic one or not, but I read this regardless. Thanks. Awesome notes on the hindquarters, and I never noticed the changing of the nose size before! Thanks for the post! This post is super helpful! 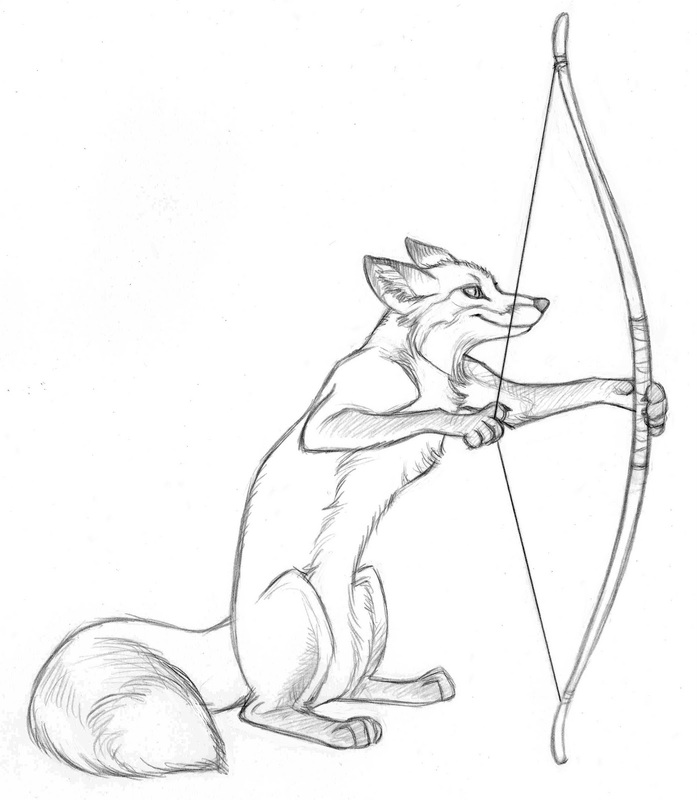 I am learning to draw animal people, and was trying to figure out just what it was I always enjoyed so much about the Disney Robin Hood design. This post explains a lot f it, and I love seeing the reasoning behind the design. It's definitely going to help me change the way I draw. 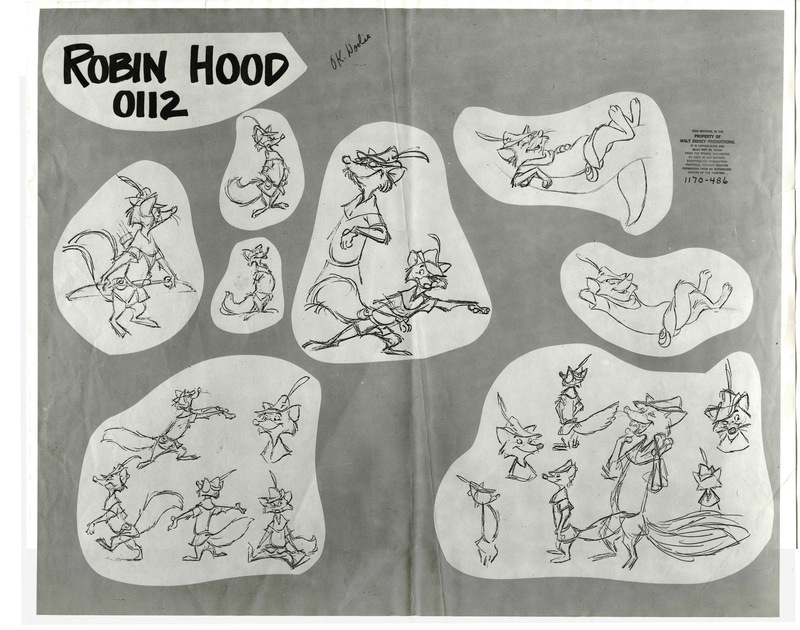 Oh how cool--didn't realize that was a Chuck Jones solution. Pretty interesting_ I wouldn't have thought to add shoes and socks to a four legged animail! The theory seems to work however- great post, very helpful. I realized I might be drawing something anthropomorphic, so this helps in steering me in the right direction. Thank you. 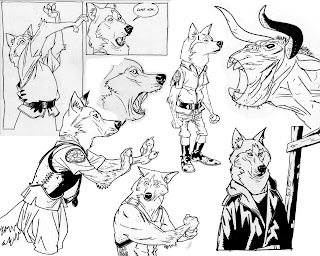 Also, Bennicke's "weird wolves are amazing! I must try that sometime. Great article, it definitely gave me food for thought. 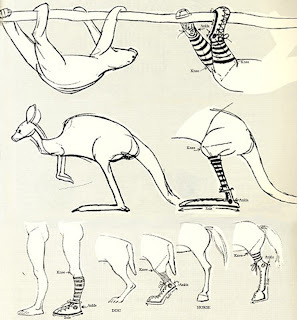 I think Chuck Jones concept of the sock and the shoe help me a lot in simplifying the anatomy of the animal and still keeping it within the context of the character. 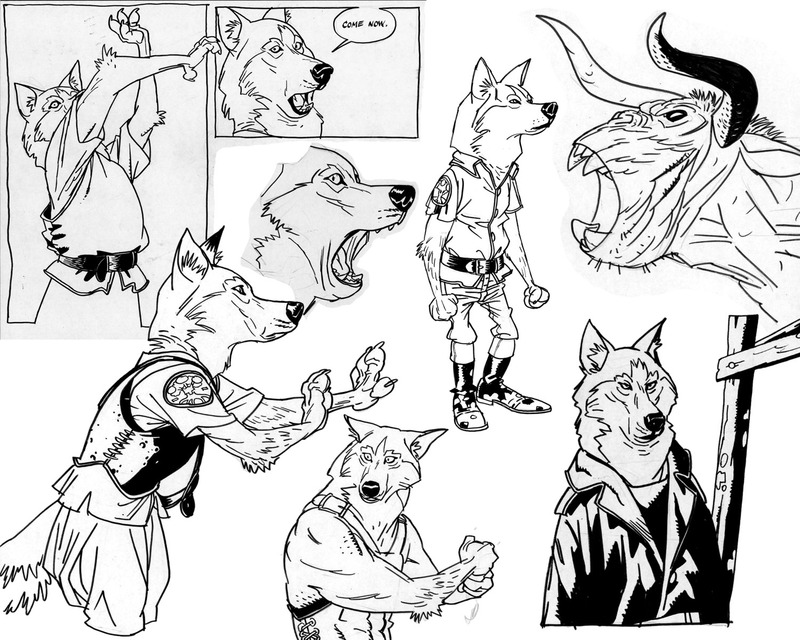 I also find this post helps with the holistic construction behind designing an anthropomorphic character. This was actually really interesting and reminded me why I am building this character and to think about the actions that this character will perform. Chuck Jones was a genius. 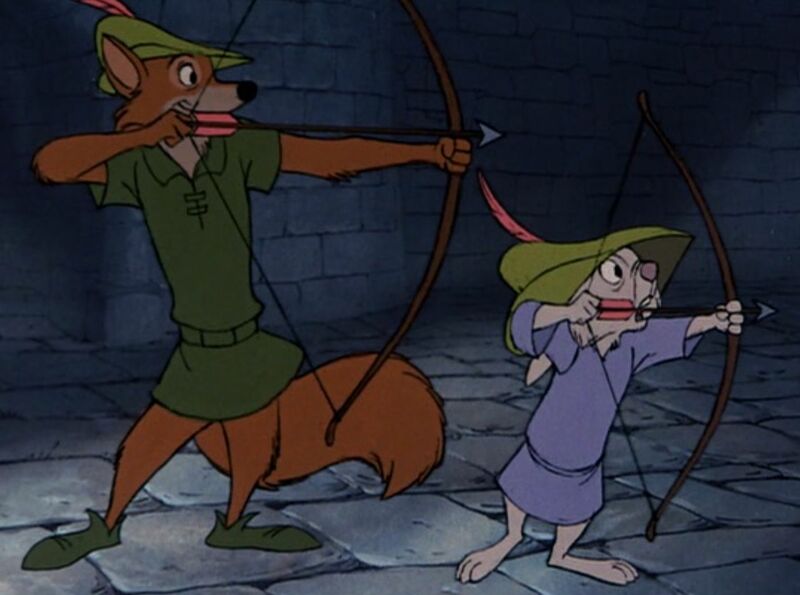 I always thought the animals in Robin Hood looked a bit odd. It's clearer to see how anthropomorphism can make a character more appealing and how to go about it. Excellent post. Not sure if I'm doing an anthropomorphic character or not, but I read this anyways. Very helpful info! 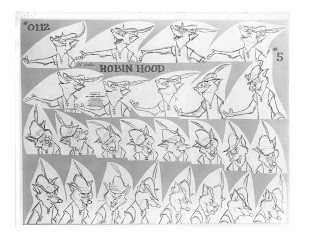 Noticed Robin Hood's legs still had a bit of fox anatomy, as did his arms. Nice read. I see so many artists online that design things to look "pretty" without remembering that it must function properly in the world in which they live. I'm glad that my psychosis about things working is actually a good thing with animation. Thanks for sharing this! Very useful information! Really interesting to see what all went into Robin's character development! I will be sure to look carefully at the anatomy of whatever animal I choose this week before starting to work on its caricature. 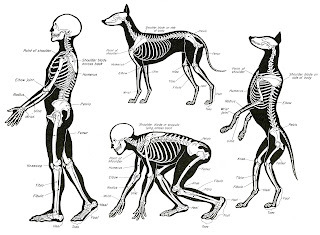 This also helps explain why sometimes it is hard to distinguish what type of animal it is...when the design gets so far from the actual animal and looks much too human. I've seen this movie a thousand times, and it's only now that I see the shoe and sock reference! This is mind blowing practicality and functionality at it's finest! Wow ! This is quite insightful ! I really liked the mention of Robin's snout getting smaller as the film progressed, I would sure like to re-visit the movie for it! 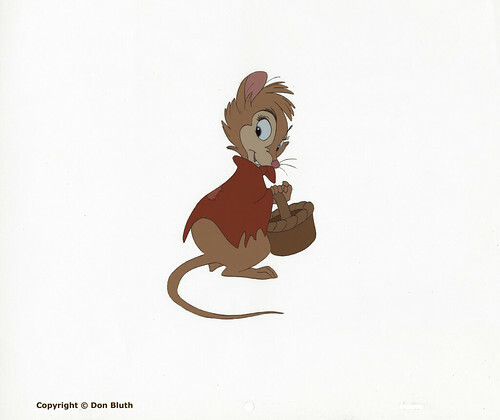 I always had a confusion when it came to switching the anatomy of the animal scapula to suit an anthropomorphic need and Chuck Jones' technique definitely makes sense!! This is very helpful. I need to bookmark this. Thank you, Jennifer! Chuck Jones' method for solving that pesky foot issue is very enlightening! Thanks for the article! I had never knew there were two different types of anthro creatures. Thanks! The sock and the shoe method is a great way to set the design straight and clear. Thank you! This post has lessen my anxiety with approaching animal characters. Such great reference, thank you! This was really really helpful, thank you! The notes are very helpful. I will follow this blog, has very insightful material. Very intriguing. It's interesting to see where they pushed the character for functionality purposes. Certainly you'd need to have him preform like a human as the story wasn't like the Jungle Book. That bit about the mouth is also insightful; never really thought how a long snout can cause problems with talking. 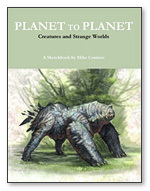 When thinking of designing one's own characters, it seems important to keep enough of the animal that the audience can distinguish what it is, but put in just enough human to allow for animation. Thanks for the post! I love the inner workings of animators! To see what goes on and how they create such incredible lifelike personalities out of animals is a wonder. So much thought goes into the smallest details. 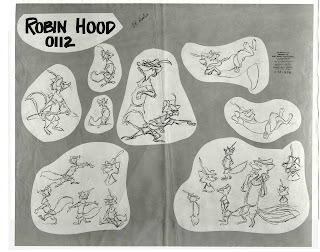 Anchoring Robin to Errol Flynn or adjusting his physiology to aid the story and animation are great practices to know.